…WITH GARDENING IS GOOD FOR YOU! Research from around the world has confirmed something many gardeners already know ­– gardening really is good for you! So, it’s time to grow yourself healthy this year with support from the Gardening is good for you campaign. Month-by-month you can explore the many benefits of gardens and gardening to your health and wellbeing. Gardens are great places to relax, and just being in or looking out onto gardens and green spaces has been shown to relieve stress, improving wellbeing and creativity. By creating a beautiful garden outside your own back door you’ll have a personal sanctuary to step out into, and somewhere to grow healthy food, welcome in wildlife, and spend time with family and friends. In fact, gardening could be described as the Natural Health Service, as doctors recognise the numerous benefits gardening brings without the need for costly therapies and drugs, with their unwelcome side effects. For instance, eating well can start by growing your own organic homegrown crops – all part of the ‘5 a day’ we all need. Herbs for example not only add wonderful flavours to our home cooking and teas but bring many health benefits too. By choosing the right plants we can design gardens that encourage birds, bees, butterflies and other wildlife to drop in for food, water and shelter, or even take up residence. Developing an all-year-round wildlife-friendly garden satisfies our own creativity and feeling of achievement, bringing us outside and closer to nature to reduce stress and improve our wellbeing. Contact with plants and the soil also enhances our health and boosts the immune system, too. By creating a garden that looks great all-year-round you’ll not only have a beautiful outlook but more opportunities to be tempted outside throughout the year to stay active and grow yourself healthy. To give your garden structure and form choose plants that offer more than one season of interest. 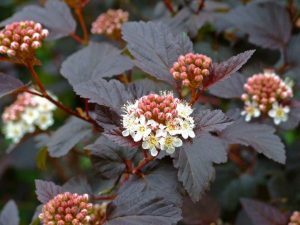 In particular, pick evergreen plants and architectural shrubs with green, coloured or variegated foliage that also produce seasonal flowers, and perhaps fruits or berries too. Plant these to form the backbone to your garden, giving it structure, and adding height at the back of borders. Use their bold shapes and sizes to obscure eyesores and cover boring fences, cut down noise from roads and neighbours, and create a sense of privacy and seclusion. Being outside and getting your hands dirty is a great way of exercising. Pull those weeds out, do that pruning! Enjoy being outside, it’s good for you!